The Spencer Savings Bank Garfield Outwater Lane branch hosted an on-site Career Exploration event on April 14, 2016 inviting a promising young Garfield YMCA member to gain a first-hand perspective of the professional world. Garfield High School Junior Michael Kramer, selected based on his strong academic performance and interest in business, spent the day shadowing Spencer employees, who encouraged him to dream big, set goals and pursue his visions. Combining insight into a variety of job functions with core teachings such as teamwork and leadership, the Spencer staff helped to place Kramer on the path toward success. 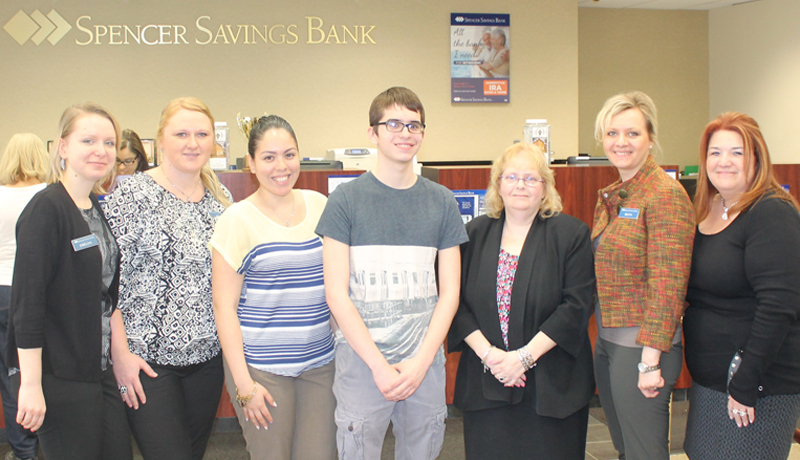 Garfield Assistant Branch Manager Sharon Styborski noted Kramer’s surprise at the many inner workings of a successful financial institution as the student spent time learning about each position, asking questions and observing different skill sets. In addition to the banking-specific content, the exploration gave Kramer an opportunity to better understand the dynamics of business in general. The Garfield YMCA has been a resource for area youth for more than 85 years, providing a wide range of youth development programs. In its mission to nurture every child and teen, the YMCA instills a heightened interest in higher education and goal achievement, a stronger will to make smarter life choices and a firm grasp of the values, skills and relationships associated with positive behaviors in the community. The Career Exploration program is one of many educational events in the Garfield YMCA’s programming.